The Print Factory & PF-2 began the flagship disc printer family for Microboards, achieving high throughput without sacrificing quality. 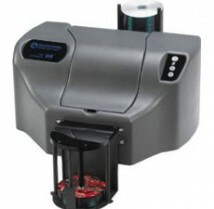 They feature high resolution, simple operation, and low cost per disc. It has an autoload feature with a 100 disc capacity so you can multitask easily. The Microboards Print Factory & PF-2 have all the efficiency and ease-of-use you would want in a disc printer. Design disc labels by adding backgrounds, pictures, and text. Print directly from SureThing or use with PrintWrite for full publishing needs. Comes standard with all disc publishers and disc printers.